Jewish music has reached a bit of a comfort zone. Albums have a formula which listeners expect: 4 discos + 4 slow songs + 1 kumzitzy-“Shiru Lamelech”-type song + 1 or 2 rock songs (optional: 1 freilach song and 1 chazzanus number) = album. Lather, rinse, repeat. Included in the formula is at least one song composed by a big name (Mona Rosenblum, Yossi Green, or Yitzi Waldner), one slow song with Eishes Chayil/Sheva Brachos lyrics (for chuppos), and one disco that—at least theoretically—could be the first song played during the second dance at a chasunah (come on, these guys have to remain employed somehow). Optional ingredients include a child soloist to sing the first verse of your signature ballad, an English or Yiddish song, or a guest star. When it comes to lyrics, you can usually get away with picking random pesukim—original lyrics are dangerous and risky. The difference between the greats and the also-rans usually comes down to how well an artist and his production team executed the formula. To be perfectly clear: I don’t consider this formula to be a bad thing. However, the very existence of the formula means that if an album strays too far from the mainstream, then it will have to be extra special in order to attract fans. Artists who have stretched the limits of the formula include Lipa Schmeltzer on one end (especially his earlier albums), and Abie Rotenberg on the other end (I don’t know if Abie even knows how to produce a formulaic album). However, every now and then an artist doesn’t just stray from the formula—he rips up the guidelines entirely, steps on the shredded pieces, and then sets them on fire. 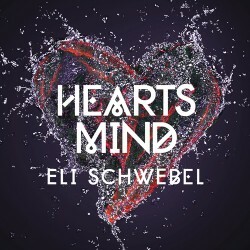 Six years in the making (and more than eight years since the release of Lev Tahor 4), Eli Schwebel’s first solo album, Hearts Mind, was introduced two months ago, and the results are nothing short of historic. While I normally listen to albums trying to figure out which song will be the go-to new disco or chuppah song, I can virtually guarantee you that there isn’t a single track on this album that will be performed at weddings or sung during davening. However, this is not to say that this is a bad album—far from it. It’s an extremely well-put-together musical experiment which will either do extremely well (and possibly alter the course of Jewish Music forever) or flop completely (which would be a crying shame). Welcome to the era of Jewish mainstream pop. Hearts Mind is, to a certain extent, the self-anointed spiritual successor to Journeys—indeed, Eli and Lev Tahor were featured on Journeys IV, Eli has covered Journeys songs in the past, and Eli names Abie Rotenberg as his primary musical inspiration in an interview with 5TJT. Like Journeys, all of the songs on the album are primarily in English (original lyrics! ), though with thoroughly twenty-first-century arrangements. The songs’ themes range from battling internal loneliness, to family, to enjoying Yiddishkeit on a day-to-day basis. Arrangements (and most of the instrumental performances) are by Eli and Assaf Spector. Track 1, “We Are One” (written by Eli Schwebel, Dove Rosenblatt, and Elie Ganz): As an emphatic opening statement, “We Are One” hits all of the right marks—it’s an upbeat power ballad (think “Better Place” by Shloime Gertner—or even “Let It Go” from Frozen) with an inspirational message of permanent Jewish unity. Track 2, “Aibishter” (written by Eli Schwebel, Avraham Rosenberg, Ari Hest, and Elie Ganz): Yes, that Avraham Rosenberg. “Aibishter” borrows the iconic first two lines of the chorus from the Tzlil V’zemer classic and surrounds it with a new melody and lyrics which detail the search for inner happiness which can only be supplied The One Above. The new arrangement is flawless—majestic and haunting at the same time, with the string arrangements by Christian Howes and Hammond organ by Billy Jay Stein adding a nice touch. Track 3, “Yagga” (written by Eli Schwebel, Gadi Fuchs, and Zach Salsberg):This track, which was released as a free single before the album’s release, is as close to mainstream Jewish music as you’ll get out of this album. The song’s theme revolves around the concept of effort (יגיעות=labor or strain) and includes the great line: “Once you know what you’re living for you come alive”. Genius. Track 4, “Like the Sea” (written by Eli Schwebel and Ari Hest): In this song (the musical sequel to Abie’s “Country Boy”? ), Eli takes us to what was obviously a tough time in his life, but when someone was able to help lift him out of whatever dark place he was in with a metaphor: “We’re just like the sea”—i.e., seemingly ever-changing, but always the same person inside. More interesting lyric work: Who knew that you could rhyme the words “feeling unable” with “Eli Schwebel”? Track 5, “Ani Yosef” (written by Eli Schwebel and Ephie Lowinger): This song lyrically follows Yosef HaTzaddik through his journey from slavery to kingship, climaxing with his impassioned question to his brothers: “Ani Yosef, ha’od avi chai? (I am Yosef, is my father still alive? )” Eli interprets the question in two ways: 1) Does Yaakov’s spirit still live within me? ; and 2) Do I still recognize my father’s love in my brothers, despite the suffering they caused me? This might be my favorite song on the album. Track 6, “Rose Like Me” (written by Zach Salsberg, lyrics adapted by Eli Schwebel): Keeping with the father-son-relationship theme, this slow country-style number details a father’s concern for a son throughout his journey through life—at age 10 (“I can’t protect you from everything…”), 22 (“Just keep working…when I go you will always remember…”), and onward (“Now I’ve been on my own/With my thoughts and my melodies…”). The chorus details his appreciation for his parents being able to raise him right in today’s “world so full of thorns”. Track 7, “Don’t Stop Giving Love” (written by Eli Schwebel, Ari Hest, and Zach Salsberg):This is another self-introspection song, focused on our abilities to keep “giving love” to those around us. This song contains some of the best lyric lines on the album, including “Are you building a wall or paving a road?/Do you take for yourself or give of your soul?”. Combined with a catchy chorus, this song is a winner. Track 9, “Shtai Auf!” (written by Assaf Spector, Yula Beeri, and Eli Schwebel): Jewish surfer rock! This fast moving song is a rocked-up “hayom katzeir v’hamelacha merubah” theme, in which Eli impresses on us the fast-moving nature of life (slightly ironically, compare to the track immediately preceding it, but maybe that’s the idea), and the need to wake up (“Shtai auf”) to face it on a daily basis. Eli Schwebel definitelydoesn’t “sing how they sing and play how they play”. I think that’s a good thing. If you are horrified by music that goes outside the yeshivish/chassidish box, then you will want to avoid Hearts Mind. However, if you like originality, heart, and feeling in your music, then you want to give Eli’s masterpiece some serious consideration.